MOSCOW, Jan. 17 (Xinhua) -- Russia and Serbia signed a package of agreements on bilateral cooperation during Russian President Vladimir Putin's visit to the Serbian capital of Belgrade, the Kremlin said Thursday. "We signed a large number of agreements in various spheres of public life. 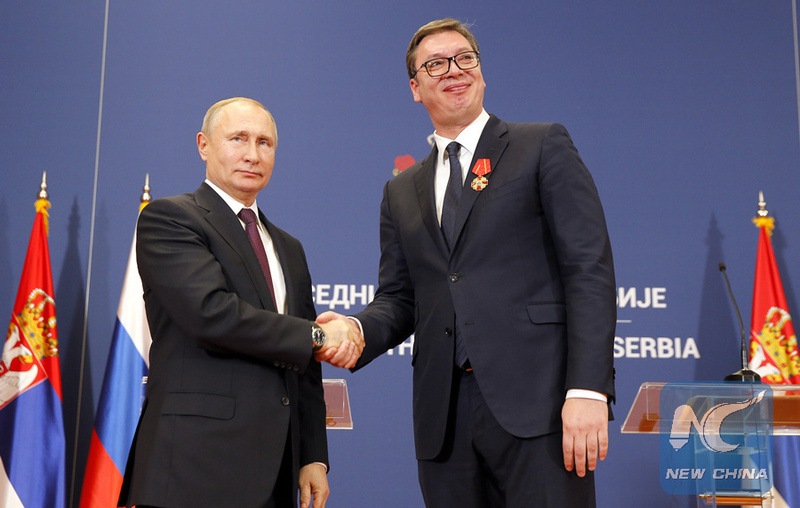 Our trade is increasing from year to year, and our economic relations are getting better and better," Serbian President Alexander Vucic said at a joint press conference with Putin following their talks, according to a Kremlin transcript. In particular, the two sides reached agreements on the construction of a gas pipeline with more gas storage facilities and on the construction of a power station aimed at realizing full gasification of Serbia. Putin and Vucic also talked about infrastructure cooperation, especially in the field of railways, and major agreements and memorandums were signed on the current maintenance of railways. The signed contracts on railways have amounted to 230 million euros and are expected to reach 660 million euros in the future, according to Vucic.